Today we’re going to guide you on how to send secret and self destructive messages on Facebook using the popular Facebook messenger app. When WhatsApp introduced the end-to-end encryption for every conversion you make with your recipient, people found it more secure to chat secretly with their recipient than on Facebook. Since they believed there conversation will be seen by unauthorized people. Although facebook had ensure its users that their messaging app is completely safe from any security loop holes. The good new is that facebook has also officially rolled out the secret conversation which supports end-to-end encryption to all its users. This feature was first released on July 2016 and was only applicable on Facebook messenger beta app. 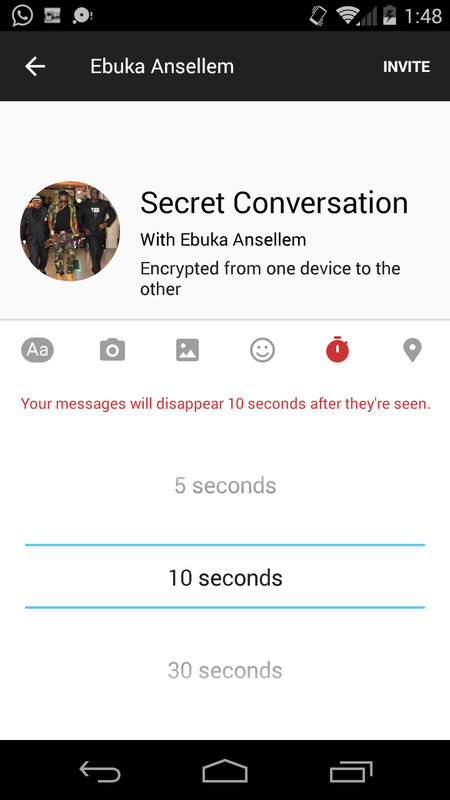 The secret conversation rolled out on Facebook messenger as an update which ensures that no one can be able to read the conversation between you and your recipient. Not even the Facebook company can be able to read or spy your messages once you learn how to enable this feature. The secret conversation been introduced on facebook is available only on the Facebook messenger app. So you can’t be able to see nor activate this feature on your desktop or browser chat (using Facebook.com). Also with the “secret conversation” update facebook rolled out, you can also be able to send self destructive messages, of your private data which is capable of getting “self destructed” after a particular time. Here’s how the Facebook self destructive message works, let’s assume you have activated the self destructive message on the secret conversation option, you can set the timer for “self destruction” on 10 seconds. The timer starts once the contact sees the message. And after the timer period (10 seconds) elapse, the message gets self destructed. How To Enable Secret Conversation On Facebook Messenger. Read the below guide carefully in other for you to learn the easiest method to activate the facebook secret conversation feature. #1. Open your Facebook messenger app and you will be presented with the friends you’ve chat or currently chatting with. #2. Now move to your profile section which is at the top right corner of the facebook messenger app and tap on it, which will take you to your profile settings. #3. Now once you’ve reached here, you will see the “secret conversation” which is beneath the photos and media. #4. Once you tap on it, you will see a toggle button. Click on it to enable. #5. A pop-up box will emerge asking you if you want to turn on secret conversation. Allow it by clicking the “Turn on” button. #6. 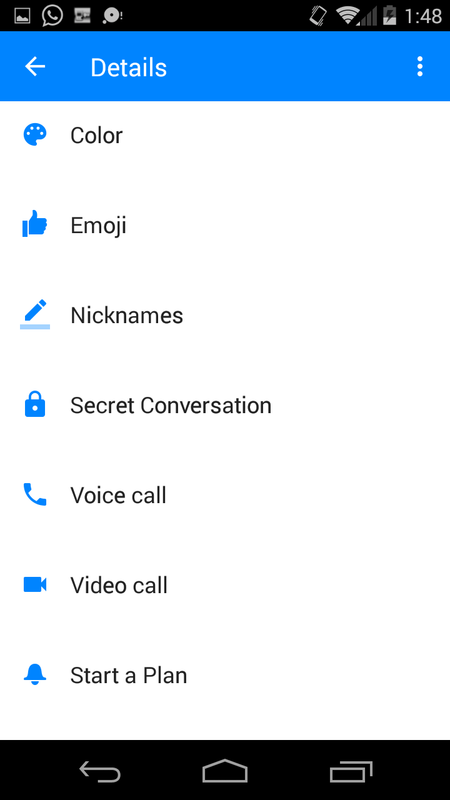 Now to start the secret chat, click on the person or contact you want to chat with secretly. #7. Locate and tap the (i) icon beside their name on the top right corner of the messenger app, and from there choose Secret Conversation option. The screen will turn to a black theme. #8. Type the message you want and send it. NOTE: Your recipient will have to agree to use the secret conversation feature before he or she can see the message you sent. 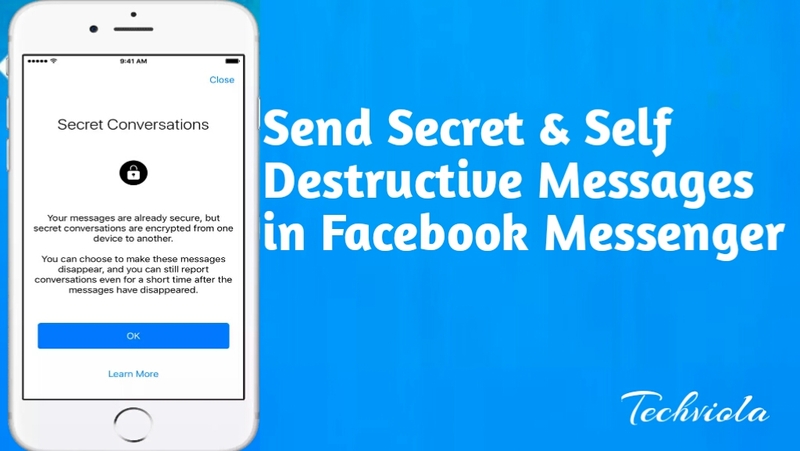 With the secret conversation enabled, sending self destructive messages on Facebook message will be a whole lot easier now. #1. Open your facebook messenger and start a secret conversation with your recipient as described above. #2. Now tap on the Timer button and set the Timer for how long you want the message to remain visible after being seen. #3. After setting the self destructive timer to your preference, type the message you want and send it to your recipient. As said earlier on, once the timer you set elapse, your message will self destruct or disappear. The secret conversation is just as normal as chatting on the facebook using your web browser. But there are some restrictions you should know, using the secret conversation features, you won’t be able to send videos, gif and voice call to your recipient. As you can see, the above step is as simple as always, with the encryption update enabled on Facebook messages, it will now be reliable to coverse with your recipient secretly. And the best thing I love above this feature is that your message gets auto destructed once the timer you set elapse.